Have a happy howloween with our pawsome pumpkin competition! Whether your Fido is a natural born poser who loves to take centre stage in your snaps, or you and your furry best friend prefer taking spooky selfies together – we want to see your pictures. The only rule is you must include a pumpkin in the pic too – it is howloween after all! Pawfect for pups and owners who love late night or earlier morning winter walkies during this spooky season, the prize has everything you need to play happily at any time of the day or night. Our competition is open until 31st October, and the full entry details can be found below. You are deemed to accept these terms and conditions when you enter the ‘have a happy howloween with our pawsome pumpkin competition’. Please also note that this competition is in no way sponsored, endorsed or administered by, or associated with, Facebook. 1.2 Employees of Chuckit! and any associated group companies and their immediate families are ineligible to enter. Any such entries will be invalid. 1.3 The closing time for entries is 31st October 2017, 11.59pm GMT. Any entries received after this time will be disregarded. 1.5 Entry to the competition must be by the applicable method and in accordance with the deadlines as indicated. 1.6 No bulk, automated, machine assisted, third party, syndicate or other group entries will be accepted. We shall disqualify any entries which, in our reasonable opinion, appear to have used any of these entry methods. 2.1 Entry is by Facebook or Twitter only. 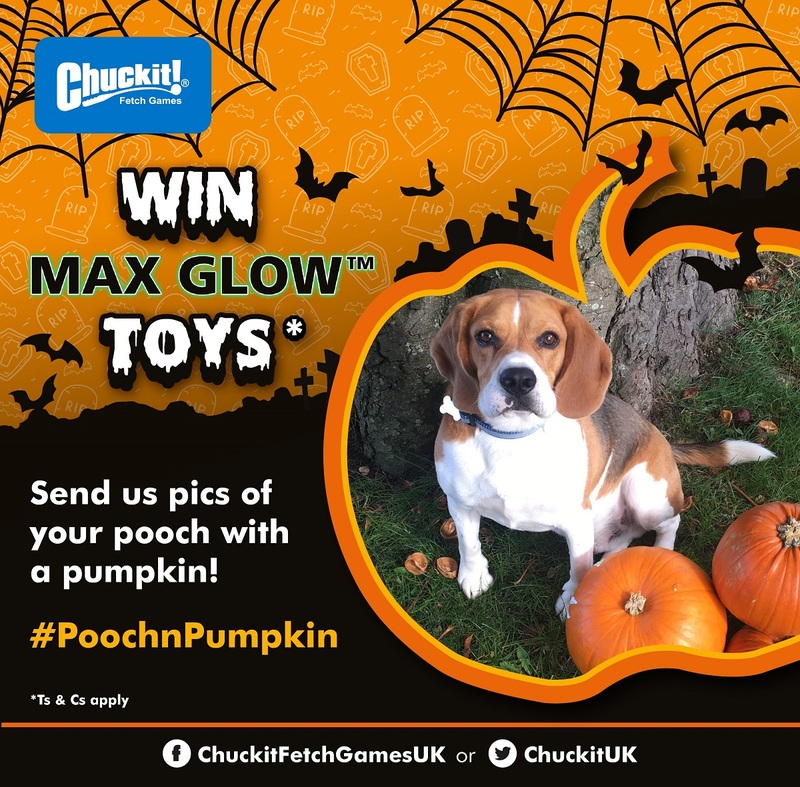 2.2 To be entered into the competition, entrants must post a picture of their furry friend with a pumpkin to the Facebook page using the hashtag #PoochnPumpkin or to @ChuckitUK using the hashtag #PoochnPumpkin. 3.1 Any entries showing or attempting to show competitor products to those of Chuckit! will not be valid for entry. 3.2 Any entries which are incomplete, incorrect, incomprehensible, or not received by Chuckit! by the due deadline will be void. 3.3 In the event of any fault, mistake, misunderstanding or dispute concerning the correctness or acceptability of any answers given by entrants, or the operation of any part of the competition the decision of Chuckit! shall be final and no correspondence will be entered into. 3.4 At our discretion, we may elect to withdraw entrants that remove a follow, like, tweet or other preference that is required as an entry. 4.1 Chuckit! will select one winner who will receive the following prizes - 1 Max Glow Pro 25 Medium Launcher and Max Glow ball set, 1 Max Glow Zipflight in Medium, 1 Max Glow Erratic Ball in Medium and 1 Max Glow Tumble Bumper in Medium. 4.2 The winner will be notified on the day after the winning entry is selected, 31st October 2017, or as soon as practical thereafter. You will have a specified fixed time period of 14 days to claim your prize. Failure to respond within the specified time period may result in forfeiture of the prize although Chuckit! will make reasonable efforts to contact the winner to ensure this does not happen. 5.1 In the event that any entrant does not, or is unable to comply with these Terms and Conditions or the Competition Information, Chuckit! shall be entitled at its sole discretion to disqualify such entrant, without any further liability to such entrant. Entrants must comply with any directions given to them by Chuckit! including in relation to any and all relevant laws, rules and regulations. 5.2 These terms shall be governed and construed in accordance with the laws of England and Wales and you and we submit to the exclusive jurisdiction of the Courts of England. 5.3 Chuckit! reserves the right to withdraw or amend any competition as necessary due to circumstances outside its reasonable control. 5.4 By uploading your photo to the Chuckit! Facebook or Twitter Pages, you acknowledge that the photograph does not infringe on the copyrights, trademarks, moral rights, rights of privacy/publicity or intellectual property rights of any person or entity, and that no other party has any right, title, claim, or interest in the photograph. In addition, by entering the competition you are agreeing to Chuckit! using this content in any future marketing activity within press and social media.